Tanita Tikaram is the 19 year old singer/songstress from Basingstoke, whose trio of hit singles – ‘Good Tradition’, ‘Twist In My Sobriety’ and ‘Cathedral Song’ – have vaulted this most unlikely pop star into the charts. No mean feat from someone who was virtually discovered at her first gig. So, it really was like an old Hollywood film? In a short space of time Tanita seems to have achieved a degree of credibility and success that disguise both her youth and her comparatively short apprenticeship in the business. Even with considerable talent giving substance to her one-woman crusade, she must realize that the incredible critical success of her debut album has all come rather suddenly? Tanita was ten years of age when she began to play the guitar, 14 when she gave it up, and 17 when she resumed her interest. Early memories of the instrument have her playing ‘Streets Of London’ with friends at her school’s folk clubs. But for a girl who openly, if not a little embarrassedly, admits to neither being a record buyer or a concert-goer in her teens, it may seem a little surprising that her career has taken off with such a definite direction. What was the spark of inspiration that caused her to rediscover the guitar and start writing songs? “Most people I knew were learning guitar at the same time and my brother had one… I don’t know why I picked up the guitar actually. I think I used to go to parties and I’d always think it was quite good when they would pick up a guitar and play. I’d always had an interest in all the arts – I’d always dabbled, and it was the one thing that I could do, it was natural to me. I think most of the acting I did I was hamming it up. I was not a natural actor, but this was something I thought I could do and it was something that I enjoyed. Tanita’s songs have an eerie, almost cynical quality that makes them unmistakable, but where do they come from? What makes Tanita Tikaram want to write? As a young singer/songwriter and guitarist, has Tanita yet developed a preference between the three talents, or is it a case of three equal parts? Tanita Tikaram has one main guiding career principle – never do anything that will prove an embarrassment. In terms of musical development, well, she just wants to carry on further down the same eccentric path that helped inspire her ‘Ancient Heart’ album. It’s a case of variation making the whole more interesting – although in this, Tanita was surely helped by the playing, producing and arranging skills of a couple of old fogies, Rod Argent and Pete Van Hooke. Between them they succeeded in giving Tanita the kind of varied instrumental backing that other notable songstresses (such as Suzanne Vega and Tracy Chapman) have lacked, at least on vinyl. 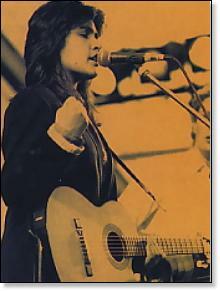 If she continues in the same vein, Tanita Tikaram has a long and illustrious career ahead. And even of she never pens another hit, her success will still be a sign of hope for any young singer/songwriters struggling with the early stages of their career. Maybe there are lessons that she can impart. From someone who’s made it, how does someone who hasn’t set about succeeding in the music business?